Songs without words, suggestive and emotional Transparency and connection, contemplation and departure, meditation and attack: this music fascinates from the very beginning. It has no need to boast or become talkative, but stays true to itself as it casually develops its poignant pulse and lets it grow, and grow. The web of sounds soon begins to radiate from within, it inspires images in one’s head, and invites to musing and introspection. Against the background of a wide horizon the details of their music join, develop a life of their own, and lift off to collective flights of ideas. This music is an invitation to listen without prejudice, offering a way to get lost in dreams while, at the same time, remaining solidly grounded and completely awake. 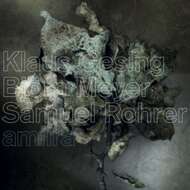 There are many connections between bass clarinetist/soprano saxophonist Klaus Gesing, bassist Björn Meyer and drummer Samuel Rohrer. The experience of playing together and sharing their innovative spirit is a pre- requisite for the artistic co- operation of this new trio, in which the love of adventure and improvisation takes precedence over the pre-composed. Because of this the evocative power of their interaction can generate such strength, the give and take of their musical discourse be so intimate. In this music a unique sound structure grows from within itself, layer by layer, and involves and enchants the listener. It is broadly emotional and without mystique or pretension. How else could these delicate dialogues develop such gravitational pull and magic? Acoustic and electronic sounds, sensuous rhythms, sumptuous woodwind-songs, earthen and ethereal bass lines, grooves and vibrant atmospheres all merge with one another and graciously rise from silence to hypnotic beauty. The inner logic of the trio’s interaction is compelling for it neither strives for attention nor takes the listener unawares. It grows and spreads coherently like a natural organism. The three of them have, each in their own right, worked with outstanding vocalists. Samuel Rohrer with Laurie Anderson and Sidsel Endresen, Klaus Gesing with Norma Winstone, Björn Meyer with Asita Hamidi – all of whom are vocalists that can evoke textures with delicate poise, avoiding trends, and express them in an entirely personal way. It also characterizes the unique quality of this trio’s instrumental music: richly coloured, highly concentrated and finely balanced, it develops a life of its own without ever imposing itself on the listener.